Ethiopia is head and shoulders above the rest of Africa in meeting the Millennium Development Goals (MDG). The Gates Foundation has released a report “One foot on the ground, one foot in the air” tracking Ethiopia’s development despite having the lowest human development in the 1990s. In the wake of massive agricultural investment, a sector which employs three in four Ethiopians and a government committed to pro-poor spending, the East African country is expected to halve its poverty. 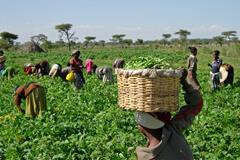 According to the report, the agricultural sector has cut poverty by seven per cent between 2005 and 2011. With Ethiopia’s development finding its roots in an agriculturally-led environment, it has included, “Maintaining teams of agronomists across vast rural areas to boost productivity by recommending best agricultural practices and scientific innovation. “Further, a doubling of Ethiopia’s road network in two decades, which has allowed more farmers to bring their produce to market,” said the report. Another key driver of poverty reduction is Ethiopia’s Productive Safety Net Programme (PSNP), Africa’s largest social protection scheme, which pays seven million Ethiopians in food or cash in exchange for work on agricultural-infrastructure projects that maintain food security and reduce the incidence of famine. Further key findings have now predicted Ethiopia to be the fastest-growing country in the world over the next three years. But unlike other nations, most notably China, Ethiopia has achieved this growth while maintaining its low level of inequality. Ethiopia’s human resource development plan centres on education, which alongside the building of physical infrastructure, is seen as a path to structurally transform the economy and to create more jobs. Ethiopia has nearly universalised primary education, flipping primary enrollment from under one in five in school to under one in five out of school. But “One foot on the ground, one foot in the air” also highlights the challenges that remain. Improvements in access to education (e.g. 190% increase in number of primary schools between 1997 and 2012/13) has often not been met by similar improvements in the quality of education.